EZ Cap Audio & Video Capture Device can be found online in the collection of Amazon imported products in Pakistan via online shopping. It has easy to operate software which supports only capture applications. 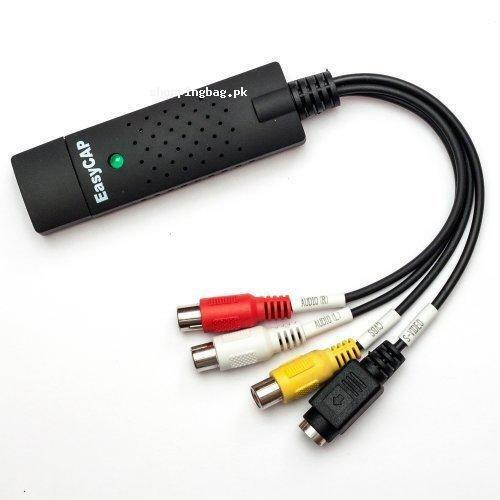 EZ Cap Audio & Video Capture Device can work remarkably on 32 and 64 bit of Windows but it suited well with Window XP/ 7 / Vista, Camcorder, satellite, DVD Player, play station and others. It is available online in reasonable price so you can find EZ Cap Audio & Video Capture Device price in Pakistan through Amazon online Shopping in Pakistan. EZ Cap Audio & Video Capture Device has 4 plugs for connecting with any system and these plugs include S-video, CVBS, audio (L) and Audio (R). You can connect any audio and video capture device with this unique USB. On single placement of order for EZ Cap Audio & Video Capture Device, you can get it at your doorstep anywhere in Pakistan with the facility of cash on Delivery. You will get original and genuine EZ Cap Audio & Video Capture Device which will directly imported from Amazon online Shopping to Pakistan. Place your order and enjoy Amazon imported products in Pakistan now.